After my big garage sale excitement (and after my daughter's softball game), I ventured out to an antique mall that I had never been to before. It was wonderful and much better than the one I normally visit. As I entered the building, I came upon the most lovely blue dresser. It literally stopped me in my tracks. I stared at it for some time...the fabulous color...the worn paint...the vintage glass handles...sigh. Then I did what any furniture lover would do, I took out my tape measure (which I always carry in my purse) and took some measurements. After that, I pulled a paint chip from my purse. The color? Sheer perfection! Sigh. So, I walked away and spent some leisure time wandering the booths and looking at many beautiful things, all the while thinking of the blue dresser. I honestly could have bought a zillion things, but the dresser would not leave my mind. I managed to pull myself from the place (surprisingly empty handed and not without visiting the dresser again) and I drove home. When I got home, I was so excited and chatty, that I nearly lost my breath telling my husband of the wonders of this new-to-me antique mall. I saved the best for last and told him of the blue dresser. He waited for my incessant chatter to end, teased me a bit, and then said, "Go buy your dresser." I nearly fainted! It was too late to go back and get it just then, so I had to wait until he could take me on Sunday. Well, of course, Sunday came and it was pouring rain off and on. Darn! My dresser would have to wait. Monday morning arrived and my husband told me to describe where the dresser was located in the store and that he would go get it while I was at work. (Luckily, he had a few days off from work.) Then came the time when I had to fess up to him. I told him to check it out, make sure the drawers opened, and the thing wasn't falling apart because in my ga-ga state, I clearly did not take in those kind of details! Mid-morning I get a text from my husband saying he tried asking for a better price, but they will only do that when a piece has been hanging around for a time and this piece was fairly new. I immediately thought, oh no, he's not going to buy it, he thinks it's too much money for junk. He then texted asking me if I still wanted it. However, I did not see this message until about 10 minutes after he sent it. I replied back, "What do you think?" "I liked it, I bought it!" Yippee! I couldn't believe it! He liked it? I mean I know my husband loves furniture as much as I do, but a chippy old blue dresser is not exactly his idea of furniture. 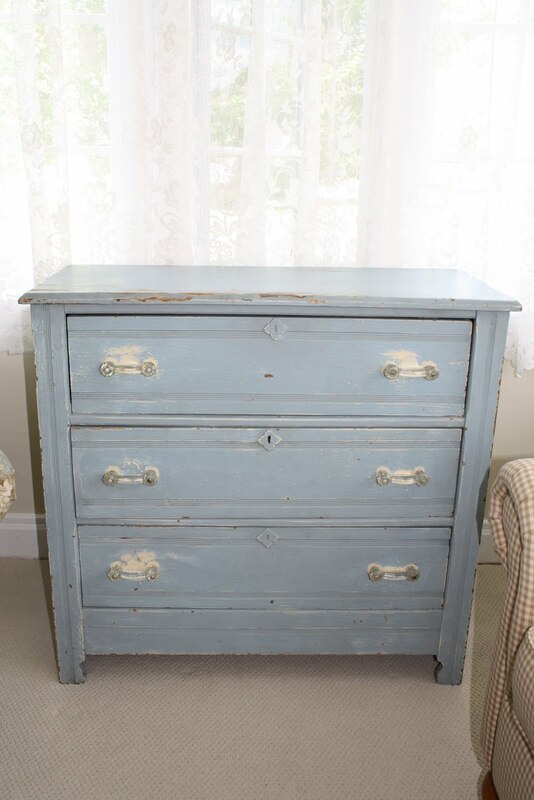 Oh sweet blue dresser, how I adore you! I swear I just keep staring at her. Something about this thing puts me in a dream-like trance. Here she is, in full view, in the sitting area of my dining room. 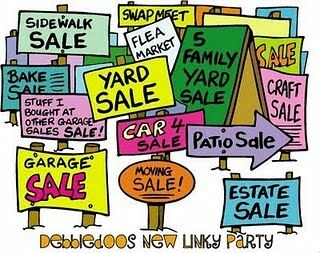 Edited to add: I didn't realize this at the time I posted it, but why not link this over at Debbiedoo's Garage Salen Party? Thanks Debbie for hosting this party and for being a wonderful hostess to boot! I ABSOLUTELY LOVE IT! It is perfect for your room. I would have had to buy that one too! I think I sense some more vintage pieces coming into your house, am I right??? You go girl! Gotta love your hubby, that was so sweet of him. I'm a true believer in fate and that dresser was meant to be in that room. The color is perfect for it. I have dresser envy! Enjoy your find!!! It IS perfect!! I admire your self restraint in walking away the first time ~ I, unfortunately, am not bless with that level of self-control. It looks just perfect in your living room!! Your dresser is beautiful....your sitting area is beautiful...your husband is a peach of a guy! Oh, Gina it took my breath away...I love the shade of blue and the handles! 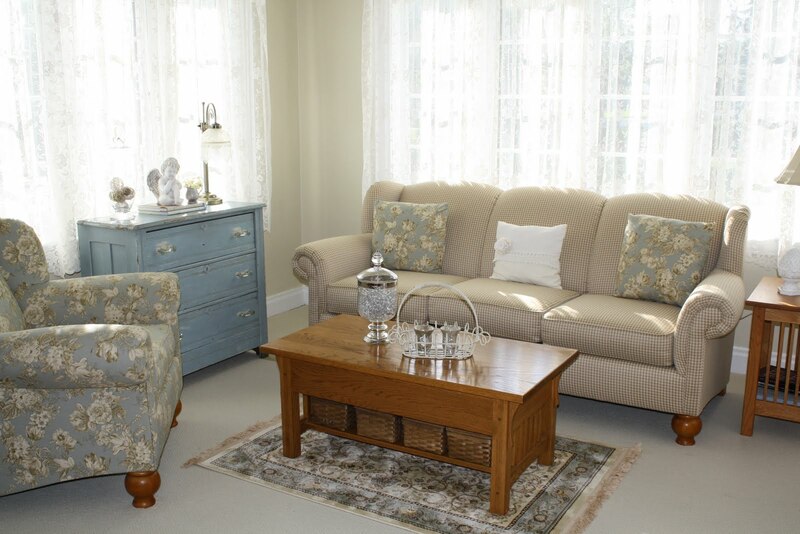 It looks just right in your room like it was made for it, lucky you and what a fab husband you have! Oh so lovely!!! I would not be able to resist that either!! Enjoy! Fabulous Dresser! I would have scooped that up as well! You were so very right not to pss up this blue beauty!! It is just lovely and looks fantastic where you have put it in your home!! I have found that when something calls out to me, I better buy it or i find that it haunts me when I get home without it!! LOL!! Oh Gina~ it IS perfect! I love the color and it transforms the room you put it in! Isn't it great when you find something so wonderful?! Stopping by from debbiedoos party! Love, love, love the dresser!! It looks awesome in your room. What a great hubby!! 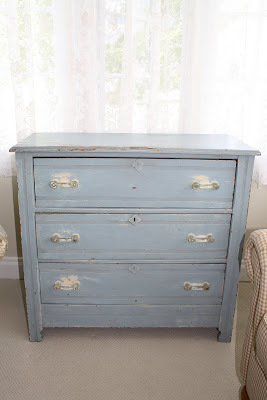 I love the size of the dresser and the pretty shade of blue! Looks great in your room too. Love when you find something that just works so perfectly! Great find! Glad you didn't repaint! That is such a great find - the color is fantastic! I love how you carry a tape measure and paint chip around with you - too funny! I bet your husband made your day when he bought that, I know I would have been shocked! I have to start following you - your blog has so much cool stuff on it! Hi, Gina! Just stopping by from Debbie's Garage Salen Party;0) I think the blue dresser is wonderful, but the best part is how great your hubby was about helping you get it!! Presh!